A mature treed 2.9 acre property for sale in the desirable North Riverside area of Nova Scotia, Canada. Year round access as well as access to the beautiful Milford Haven River, this is an ideal piece of land a vacation home and residence - an excellent property for immediate use or as investment in recreational land. Location: North Riverside, Guysborough County, Nova Scotia. Overlooking Lot 9 and North Riverside down to the Milford Haven River. This is a very pretty region of Nova Scotia. Overlooking Lot 9 with measurements. Overlooking Lot 9 at North Riverside and northwards along Old Monastery Road. Lot 9 road frontage on Old Monastery Road. Looking north along Old Monastery Road. Lot 9 is on the left with 250 feet of road frontage. Looking into Lot 9 / Lot 10 boundary line from roadside (Old Monastery Road). Looking south along Old Monastery Road - Lot 9 is on the right about a kilometer down the road. Picture taken within Lot 9, North Riverside. The land is beautifully treed throughout in Spruce trees. The Milford Haven River just a minute or so from your land along North Riverside Road. The fishing and boating here is excellent - from here you can take a medium sized boat right out to Guysbourough Harbour and Chedebucto Bay (Atlantic Ocean). Overlooking Guysborough and Guysborough Harbour and looking westwards towards the Milford Haven River. Your land is approximately 10 km from here. Survey highlighting Lot 9, North Riverside. All measurements are shown in meters. Here is an air photo outlining the location of Lot 9 at North Riverside and proximity to the water. 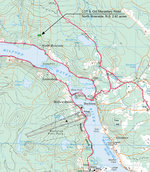 Here is a topographic map indicating the location of Lot 9. Elevation of the land is approximately 60 meters above sea level. Map showing the location of your land. 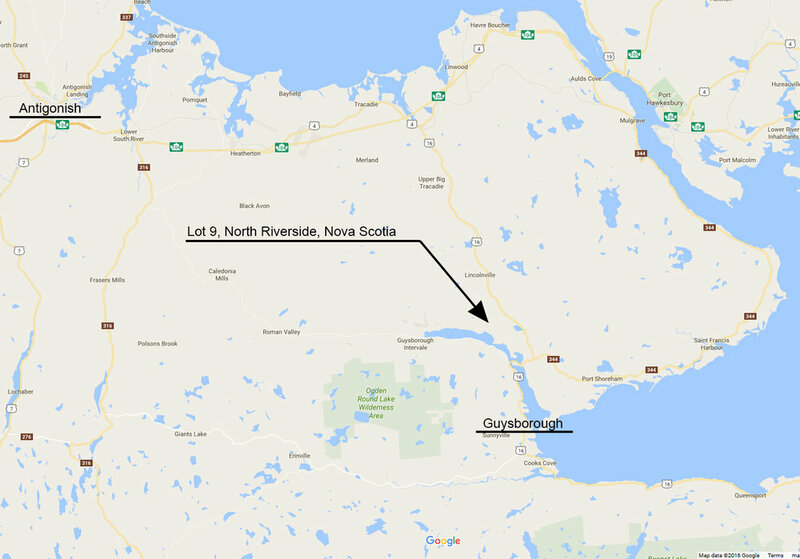 Guysborough is just a few minutes to the South and the University town of Antigonish is within 40 minutes drive. Map of Nova Scotia indicating the location of your land (green dot). Location and access in all seasons is excellent. 2 hours from Halifax International Airport. 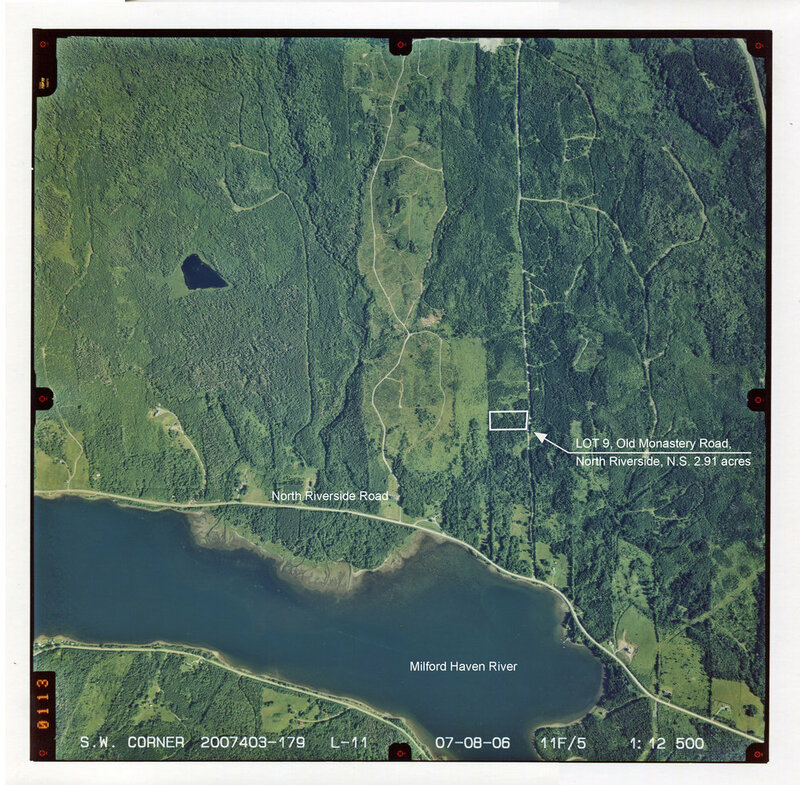 Land located at North Riverside, in the County of Guysborough and Province of Nova Scotia. 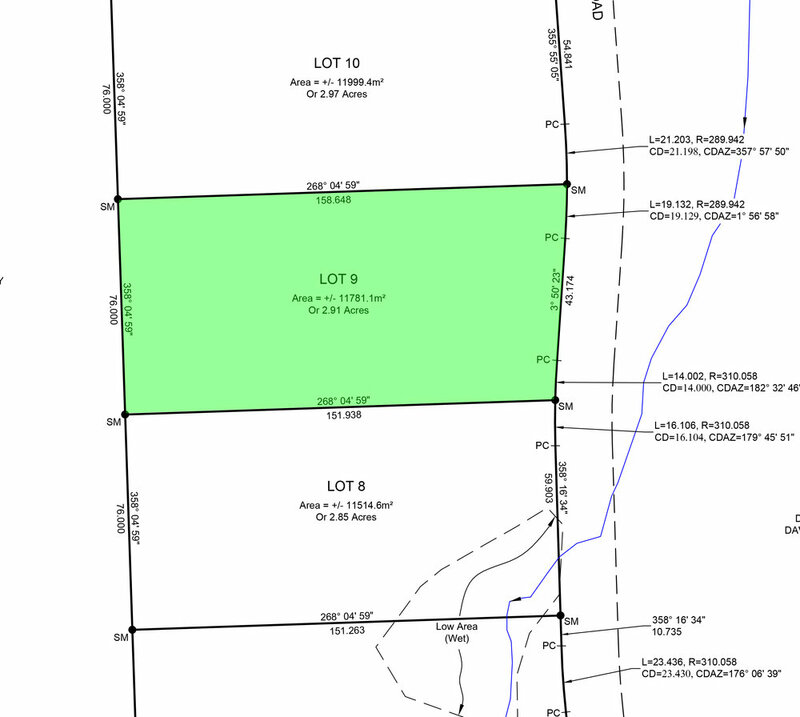 Lot 9 on a Registered Survey Plan. SIZE: 11,781.1 square meters (2.91 acres) in area. - 76.3 meters (250.3 feet) roadfront along Old Monastery Road. - An average depth of 155.3 meters (509.5 feet). - Surveyed and buildable - lot signs posted and property boundary lines clearly marked. - No restrictive covenants and no timeline to build and improve the land. - Low Property Taxes and Low Ownership Costs. - Only minutes to excellent fishing, boating, swimming, watersport! - Near to the towns of Boylston and Guysborough with public boat launch sites, wharfs and amenities. - Atlantic Ocean - Guysborough Bay, Chedebucto Bay are easily reached from your land. - Excellent access via a great network of maintained highways and roadways. - Great shopping and restaurants nearby in Antigonish and Guysborough. This is a lovely mature treed property in Northeastern Nova Scotia near the charming seaside communities of Boylston and Guysborough. Less than a half mile away is the beautiful coastal shoreline of the Milford Haven River which runs out to Guysborough Harbour and Chedabucto Bay (Atlantic Ocean). The land is fully surveyed and the property boundary lines are clearly marked, making your land use and future development very easy. There are no requirements to build or improve the land and there are no restrictive covenants in place so you can simply purchase and own the land and develop it at your own timeline and in stages, it is entirely up to you. Land ownership costs are very low as annual property taxes are only CAD-$100- per year. The property is offered with private access to the Milford Haven River - a wide tidal river, and inlet of Guysborough Harbour and Chedabucto Bay (Atlantic Ocean). You can moor a boat just off the shore from the water access lot and boat to the communities of Boylston and Guysborough to reach your favorite restaurant and coffee shop and attend a community event. Both communities also have public wharfs where you can dock your boat and sailboat and launch your boat into the water. Electricity and telephone service will be made available at roadside. Cellular service is available here as well. The land is treed throughout in mature evergreen trees. Tree rights come with the land so you can clear an area within the lot to create wide panoramic views of the surrounding countryside or keep it as is to maintain a very private wooded setting. Fishing for Mackerel and Brown Trout in the Milford Haven River is very good. And if you are into watersport - waterskiing, tubing, sea kayaking and canoeing, stand-up paddling, motor boating and sailing, then this is an excellent place for you and your family as there are miles of shoreline to explore and enjoy. The Milford Haven River is a large body of water, largely protected from strong winds and high waves of the open ocean. It extends westward 4.5 kilometers before narrowing to North Intervale Brook and Valley River. 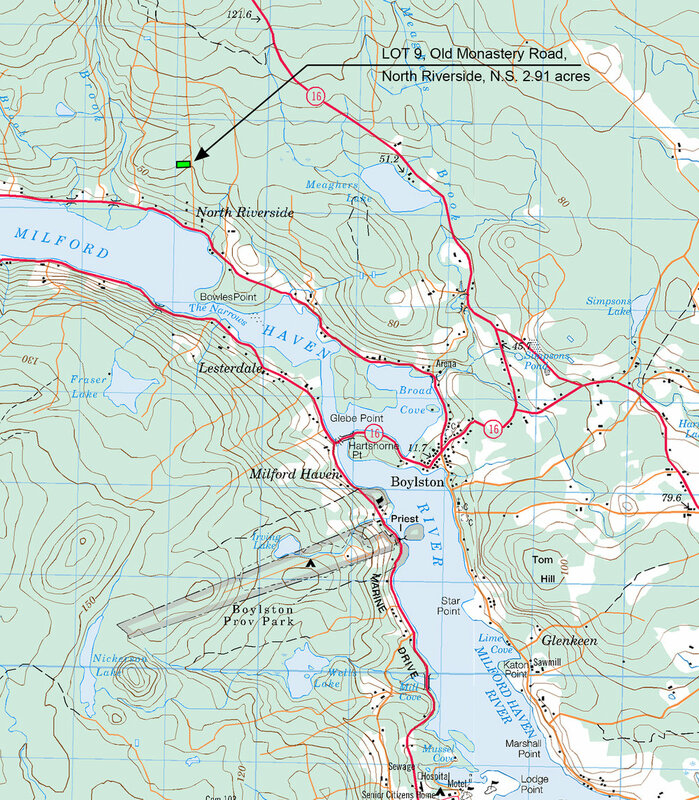 Heading eastward along the Milford Haven 5.0 kilometers will take you to the Boylston community wharf and another 5.0 kilometers to the town of Guysborough. Welcoming locals will make you feel right at home here. By car, your land is within easy reach of the nearby communities via well maintained paved roads (plowed for snow in winter months). It is only 5 minutes to Boylston and about 12 minutes to Guysborough. Between the two communities you have all the necessary amenities for comfortable and active living. Health Care, Schools, banking, post office, gas, groceries, building supplies, coffee shops, entertainment, accommodations, and a wonderful array of recreation and fitness facilities. Climate. The weather can be summed up into one word - moderate. It rarely gets extremely hot or extremely cold. The daily temperature does fluctuate both by time of day and by your proximity to the ocean. Getting here is easy. 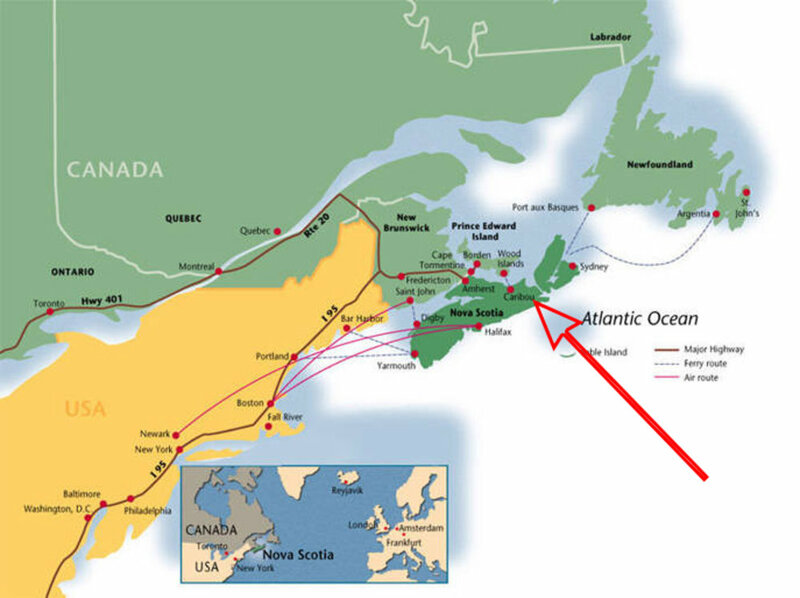 From the City of Halifax or Halifax International Airport it is just over 2 hours away by car. With convenient direct flights to Halifax from the United States, the United Kingdom and Europe, international owners are usually within a day’s reach of your land. Lifestyle. Owning land here is a great opportunity to enjoy the slower pace of small town living - whether it's for a vacation a few times a year, or as a full time residence. The serene and scenic setting here makes you want to stop and appreciate the simple things: admiring the views, breathing in the fresh maritime air, and hiking around your land while watching for wildlife and birds flying overhead. Clearings on the land will provide perfect building sites for your dream vacation cottage or year round home. No matter the season, there are many activities and vacation pleasures to enjoy here in North Riverside. In the spring and summer, you can look forward to swimming, boating, and fishing for trout and mackerel. The nearby Ogden Round Lake Wilderness Area comprised of 5,490 hectares of protected lands provides local opportunities for wilderness recreation. There are good opportunities for hiking, and several of the larger lakes are ideal for fishing and exploration by canoe. The immature old-growth deciduous forests in the wilderness area are considered to be regionally significant, protecting valuable habitat for local species. In the fall, a dazzling show of color will take place around your land as the leaves change. This is a fantastic time to explore the most eastern leg of the Trans Canada Trail, the Guysborough Nature Trail, by foot or bike. Outdoorsmen will enjoy hunting in the area. And it's also the perfect time to drive the world renowned Cabot Trail on Cape Breton Island just a short distance from your land (the Cabot Trail is ranked as one of the World's 10 Most Beautiful Highways by Fox News Travel). In the winter months, you can look forward to snowshoeing, cross country skiing, and snowmobiling on scenic wood roads and trails surrounding your land. The local Boylston Curling facilities are just a few miles up the road. If fresh seafood is your thing, locally caught lobster, crab, and cod is readily available as are oysters, mussels, clams and scallops, harvested in Nova Scotia and neighbouring Maritime Provinces. This is a wonderful water access property that you will enjoy for years to come. Please contact if you have any questions or would like additional information regarding our easy purchase terms. PRICE: Term Sale: $18,900.00, payable $1,620.00 down payment to secure the land and seventy-two (72) monthly payments of $240.00 each, and interest. Additional 10% discount if paid in full within 30 days: $17,010.00, if paid $1,510.00 cash with order and the balance of $15,500.00 within thirty days thereafter.